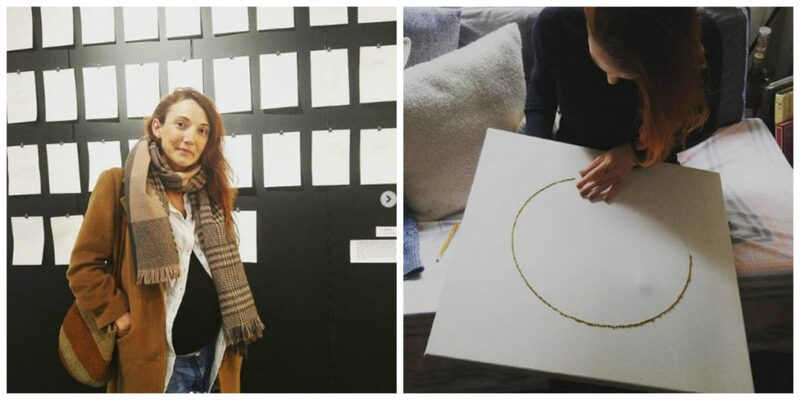 Last fall, we welcomed our AGGV Studio Coordinator, Oona McClure (art therapist and artist), back to the Gallery after the birth of her son. During her pregnancy leave, she focused on a new body of work titled ‘The Journey’, a collection of works (“Marked Moments” and “Wails of Becoming”) recording the unfolding experience of being pregnant with her first child and her evolving relationship to motherhood. “Marked Moments”, documented the physical, cognitive and emotional realizations that transpired throughout pregnancy. A weekly drawing symbolizing the gestational age was created by inscribing paper with the equivalent number of circular marks. Photo credit by Andrea Walker Collins. 37 ‘drawings’ were exhibited in the Strong Women. Strong World. exhibition at the Victoria Arts Council Pop-Up Gallery at the Bay Centre last spring (March 2018). The complete series was exhibited alongside “Wails of Becoming” during Integrate Arts Festival this past summer (August 2018) where Oona was a featured artist. 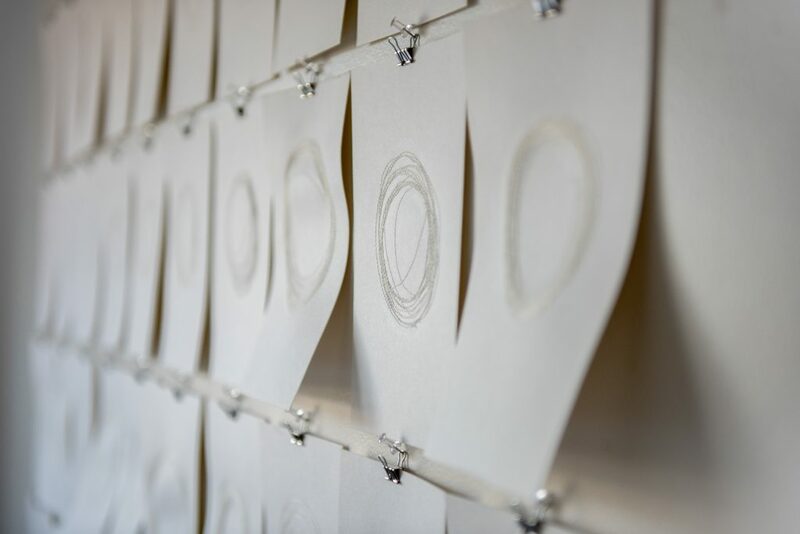 “Wails of Becoming”, is a series of embodied drawings that have been embroidered onto antique linen (pictured above). The original drawings were marked in a sketchbook with pencil each time a contraction occurred during early labour. 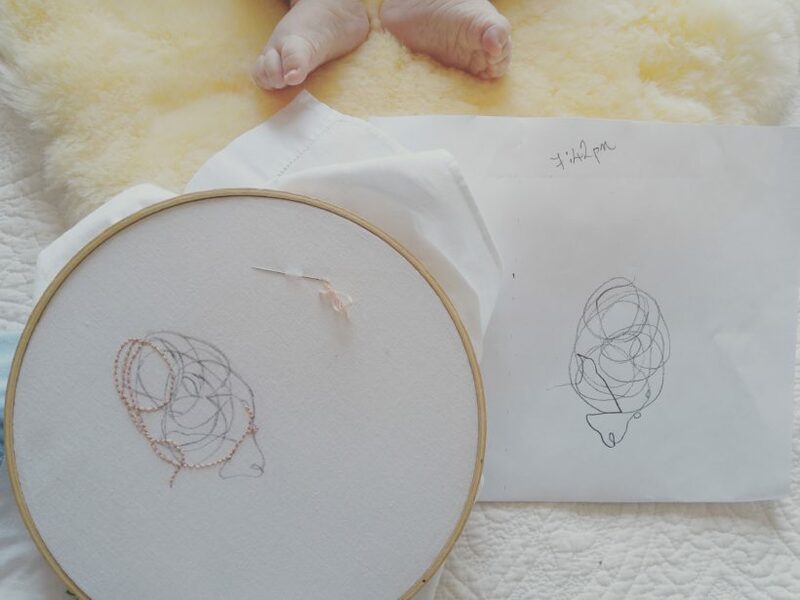 Presently Oona is working on another textile mark-making piece that is a daily commitment to the complexity of her identity since it acquired the styling of ‘mother’. Oona McClure, AGGV Studio Coordinator. The experience Oona gained through her commitment to this project, inspired her to facilitate a unique self-care workshop at the AGGV Gallery last fall titled ‘Honest Motherhood’. She invited participants to reflect on how the pregnancy and parenting experience informs the sense of self and can shape the direction of creative expression. Starting in January 2019, we are pleased to announce that ‘Honest Motherhood’ is coming back for another season and we’ll be introducing a range of engaging new classes and workshops. We’ll also be rolling out firm favourites so be sure to register to secure your spot. Nurture creative curiosity and artistic exploration in yourself and family this winter by trying out a little art-making in the AGGV Studio! In the meanwhile, check out our current BRAINSTORM exhibition to see the creations, thoughts and ideas of studio learners from the fall season.